Instagram has begun rolling out sixty-second video ads to marketers. “We recognize that advertisers have a variety of creative resources and want to bring more choice to help them reach their business goals,” a spokesperson for the company tells us in an email. T-Mobile is one of the first to take advantage of the new sixty-second ads, promoting their extended Super Bowl spot, which features Drake. Warner Brothers was also part of the initial test for the format with its upcoming film How To Be Single. 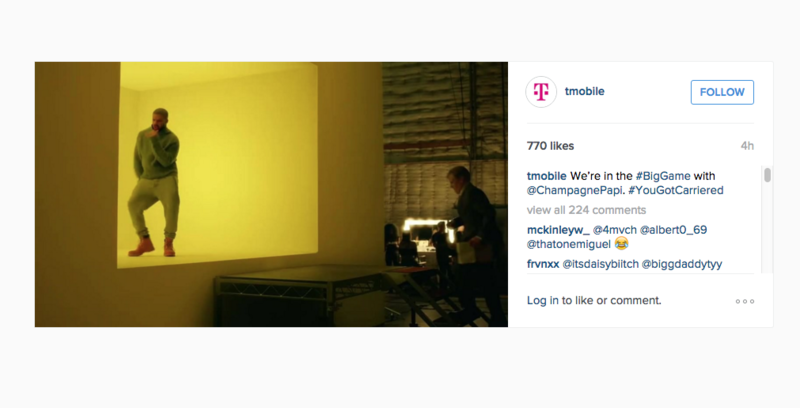 T-Mobile’s Instagram video is an extended version of a 30-second ad that will run during the Super Bowl. It was first teased on Facebook on 02/01 with a thirty-second video. In other Instagram marketing news, Facebook announced that both Facebook and Instagram now support longer reach and frequency campaigns.